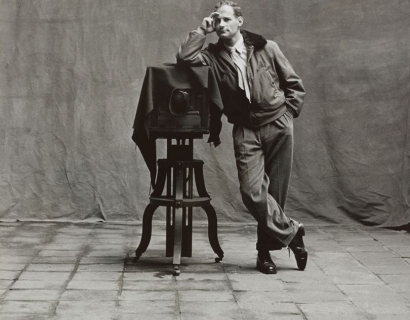 Irving Penn (1917–2009) began his career as a fashion and celebrity photographer working for Vogue magazine. He later used the techniques from his early portraiture work when he traveled around the world, photographing indigenous people in a portable studio he set up in various locales. Relying on the physiognomy and dress of his sitter rather than the context of a background allowed him to represent sitters in a similar manner to the celebrities he photographed in his earlier work, using natural light and a neutral background. This elemental portraiture of indigenous people is demonstrated in his published works, Worlds in a Small Room, Portraits in a Corner, and The Small Trades. Irving Penn is also known for his still lives of food, flowers, and detritus—cigarette butts, discarded paper cups, and chewing gum. The collections of the Museum of Modern Art, the Metropolitan Museum of Art, the National Portrait Gallery, the Art Institute of Chicago, and the Victoria and Albert Museum, among many others, hold Penn’s work. National Museum of American Art and National Portrait Gallery, Washington D.C.
Vogue discusses the exhibition marking the 100th anniversary of the great fashion photographer, Irving Penn at the Grand Palais in Paris.